(From left) Beth Simone Noveck, Director at The GovLab, Aleks Berditchevskaia, Senior Researcher, Centre for Collective Intelligence Design at Nesta, Stefaan Verhulst, co-founder and Chief Research and Development Officer at The GovLab, and Shaina Horowitz, Director of the Urban Tech Hub at New Lab. What is the value of sharing data in New York City? How does access to data change decision making and problem solving in the realm of cities? And, do stakeholders, in both the public and private sector, have the skills and tools needed to effectively harness data? The Circular City program is helping to answer these critical questions for city leaders, urban tech startups, civil society, enterprises, and applied researchers; all of whom are working together to accelerate the development, investment, and commercialization of breakthrough urban technologies that can be applied responsibly to meet the needs of New York City and its residents. Research is baked into The Circular City program to capture learnings on new approaches for assessing and capitalizing on the value of data for a variety of use cases. Researchers are exploring how data can influence key areas of urban life, such as the way people travel from point A to point B, the way small businesses access capital, and how we can manage street-level activity to promote public health. With Downtown Brooklyn as the test case, the group is exploring how emerging technologies can improve the ability to quantify this kind of city activity at the neighborhood level. The Circular City research strategy is led by Columbia University’s André Corrêa d’Almeida, founder of ARCx. The agenda is driven by a cross-institutional team of scholars who are spearheading specific tracks of applied research aimed at increasing our understanding of the value of data for different city-level objectives. Cornell Tech’s Arnaud Sahuguet is exploring data’s value for improving mobility, Columbia University’s Nilda Mesa is studying data’s influence on urban resilience and sustainability, and Andrew Young and Stefaan Verhulst from NYU’s GovLab are heading up the exploration into the potential for The Circular City approaches to spur economic development. Most recently, this discourse came alive with the MacArthur Foundation’s Opening Governance Research Network at a two-day convening, hosted at New Lab, on the topic of reimagining public-private partnerships. Chaired by NYU’s GovLab, the forum marked a unique opportunity for The Circular City researchers to share their work with a growing network of scholars and practitioners from institutions including the Laboratory for Innovation Science at Harvard (LISH), Pew Research Center, Arizona State University’s School for the Future of Innovation in Society, and Nesta, among others. This braintrust of interdisciplinary experts and scholars, as well as guests from institutions like UNICEF and the New York City Mayor’s Office of Data Analytics, provided input on The Circular City research approach, and will continue to act as a sounding board as the project organizers seek to thoroughly test and scale the work within New York City and beyond. Examining the supply (data) and demand (questions) dynamics that emerge when leveraging new data sources for city scale problem solving is critical. As part of a broader examination of the future of public-private partnerships, the participating research teams and The Circular City startup cohort—CARMERA, Numina, and Citiesense— joined in the dialogue to reflect on the implications for this fundamental shift in how challenges are evaluated and managed in urban centers. While the specific mandate of public and private players in the new tech-enabled city continues to evolve, what is no longer up for debate is that both need to play a role. 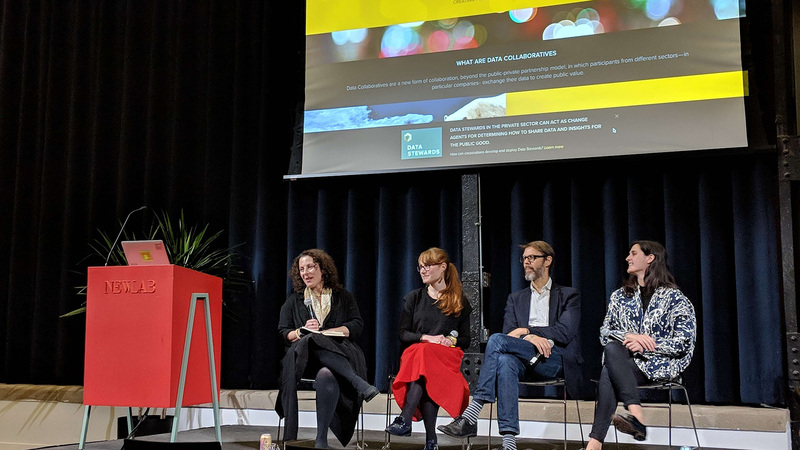 More than ever, what’s needed is a framework that empowers city governments, enterprises, startups, and civil society to develop a sustainable, scalable model of data sharing, where all can benefit from the value created. The Circular City is a program of New Lab City that is designed to bring together entrepreneurs, city leaders, corporate partners and university innovators to accelerate the development, deployment, and partnerships necessary to achieve breakthroughs in the way emerging technology can positively impact life in cities.